At Express Scripts, our commitment to diversity and inclusion is fueled by the passion and unique abilities of our 27,000 employees — a mosaic of talent that enriches our culture and ultimately helps us better serve our patients. Whether it's through our inclusive culture, development opportunities, Employee Resource Groups, or having courageous conversations, we're building and sustaining a diverse and inclusive workplace and workforce. Employee Resource Groups - Employee groups that provide a forum for networking, support, shared interests, and opportunities for development. Diversity University - Learning and development opportunities for employees to expand their diversity and inclusion knowledge and skills. Executive Diversity Advisory Board - Represents business functions from across the company and works actively to find ways to make our diversity a competitive advantage. CEO Action for Diversity and Inclusion - CEO Tim Wentworth signed the CEO Action for Diversity & Inclusion pledge, promising to cultivate an environment that welcomes diverse experiences and perspectives. Additionally, Express Scripts was the first Fortune 100 company to host the “Check Your Blind Spots” mobile museum, which helps visitors identify their unconscious bias. Experience Diversity Summit - At this annual summit, we host nationally recognized thought leaders and champions to share best practices, leading research and stories related to overcoming challenges and adversity in their personal and professional lives. By connecting individual experiences into a larger narrative, Express Scripts helps drive a greater understanding of each other and our differences. Key Strategic Partnerships - Our diversity & inclusion initiatives include partnerships with The Consortium, INROADS, NSHMBA, St. Louis Arc, MVR, MSE, and Best for Vets. Top Workplace Recognitions - As a company, our commitment to diversity & inclusion has been recognized by USBLN, Human Rights Campaign, and DiversityInc. Learn more about diversity and inclusion at Express Scripts, ​​​​​​​here. Our six Express Way values define our culture - who we are and how we work. They guide the way we do business, as individuals and as a team. Integrity - The compass that guides every decision we make and every action we take. Nothing matters more. Mutual Respect - The way we treat each other. The way we treat those we serve. Passion - The fuel that powers us. Engaging, challenging and always reaching. Alignment - The backbone of our business. We do the right thing for clients and patients. Collaboration - The way we work together. The way we do more. Service - The very heart of what we do. Compassion for patients and commitment to clients. We know people count on us every day. 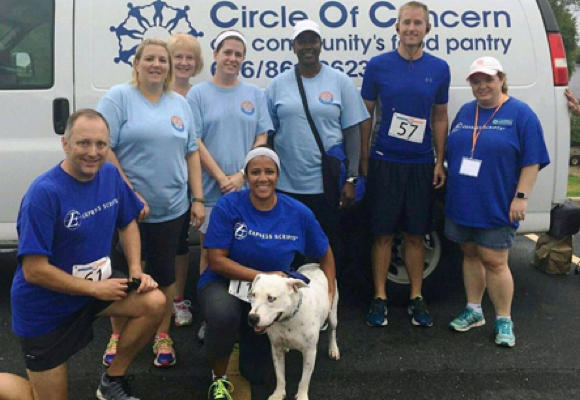 Our individual communities benefit from many local efforts, including sustainability initiatives , corporate giving , the Express Scripts Foundation , our Matching Gifts program, employee volunteer efforts and Operation Good Neighbor.